After weeks of waiting with guarded (and even fearful at times) anticipation, we had the joy of hearing Baby Barrett's heartbeat on Friday! At our appointment with Margaret (our midwife) we had the normal array of questions about how Crystal was doing, whether there were any problems, and so on. When it seemed like we were finished, we nervously asked if we were going to try for the heartbeat. "Oh yes of course," she said, "Hop up on the table!" So Crystal did and within a few (long) moments of poking around with the fetal doppler thing-a-ma-jig, there it was! 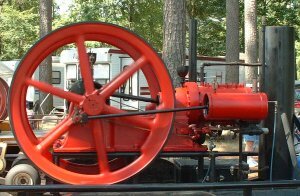 Now I must admit, the sharp clear sound reminded me less of heartbeat than an old timey steam engine we saw at the Hope, Arkansas watermelon festival last summer. In any case, he/she is definitely a strong one! One of many things that we have enjoyed discovering in Durham are the various footpaths. Since we don't have a car, we do alot of walking. To facilitate this mode of transportation, the local government has built a number of footpaths that work their way through the neighborhoods. 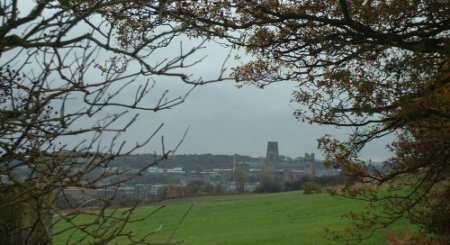 When we moved into our Newton Hall home a few months ago, we began looking for the best way to get to the city centre of Durham, about 2 1/4 miles directly south of us. We soon found a scenic walk that went from the back gate of our garden, through a forest, by a stream, over the railroad tracks, through a field, to the city, over the river, and to downtown Durham. This ended up being somewhat circuitous (and a little muddy) for daily use, so I have usually opted for walking along the road, which is a little noisy but quite direct. Last week (after the Guy Fawkes celebration [a story for another day]), Crystal and I decided to explore some of the footpaths-not-taken to see what we could find. We were thrilled to find a nice path that stays off the road for the most part, goes through some very pretty countryside, and takes us pretty directly to the city and my classes. Another nice quality is that you can see the cathedral in the distance almost immediately, which provides a nice gauge of your progress. Our first time exploring this path, there was some construction going on as we passed the police headquarters, and we were very entertained by this sign. It made us wonder if we would see some ents passing by if we just sat quietly and waited. But alas, we didn't see any. Maybe on our next walk!